The code loads various modules, parses the file and constructs a corpus and matrix from the words in each review. It then outputs various statistics and graphs regarding them. 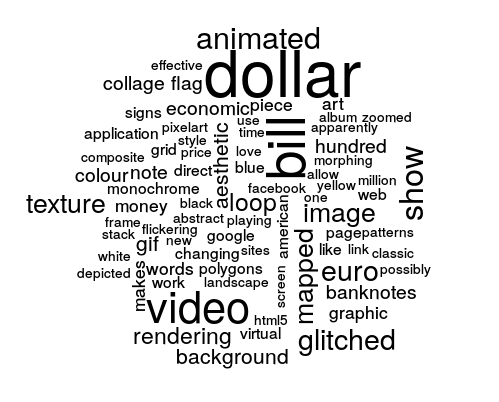 "animated" "bill"     "dollar"   "euro"     "glitched" "image"
The most popular subjects are dollar and Euro bills. Art about them shows something about them. It does so using video, animations (whether video, Flash, or HTML5), images, glitch and texture mapping. "aesthetic"  "animated"   "art"        "background" "banknotes"
 "bill"       "collage"    "colour"     "dollar"     "economic"
 "euro"       "flag"       "gif"        "glitched"   "graphic"
 "hundred"    "image"      "loop"       "makes"      "mapped"
 "money"      "note"       "piece"      "rendering"  "show"
Flags and words join the subjects, hundred unit notes are the most popular, looped animated GIFs, collages and graphics join the forms and figure/ground relations are there with mention of “background”. "abstract"    "aesthetic"   "album"       "allow"       "american"
 "animated"    "apparently"  "application" "art"         "background"
 "banknotes"   "bill"        "black"       "blue"        "changing"
 "classic"     "collage"     "colour"      "composite"   "depicted"
 "direct"      "dollar"      "economic"    "effective"   "euro"
 "facebook"    "flag"        "flickering"  "frame"       "gif"
 "glitched"    "google"      "graphic"     "grid"        "html5"
 "hundred"     "image"       "landscape"   "like"        "link"
 "loop"        "love"        "makes"       "mapped"      "million"
 "money"       "monochrome"  "morphing"    "new"         "note"
 "one"         "page"        "patterns"    "piece"       "pixelart"
 "playing"     "polygons"    "possibly"    "price"       "rendering"
 "screen"      "show"        "signs"       "sites"       "stack"
 "style"       "texture"     "time"        "use"         "video"
 "virtual"     "web"         "white"       "words"       "work"
No surprises there, except possibly “love”. The code will confuse “Euro” and “European”, so that’s why the US is mentioned but not Europe. Facebook and Google add corporations to the subjects. Colours are added to the formal properties: yellow, blue, white, black. Landscape joins the subjects. And works play, are direct, are classic, have style, an aesthetic, a price, are new. And I weasel about them with “possibly”. Next lets look at the associations between words. First some obvious ones. The corruption found in association with art here is aesthetic, thanks to glitch art. The word cloud in the next section has some stand-out words. We can look at their associations as well to follow suggestions from within the data. Videos are mostly on Vimeo. Dollar and bill occur together so there’s no surprises there. Do those make sense to look at the art? I chose ten clusters arbitrarily. There’s some overlap looking at the two techniques. 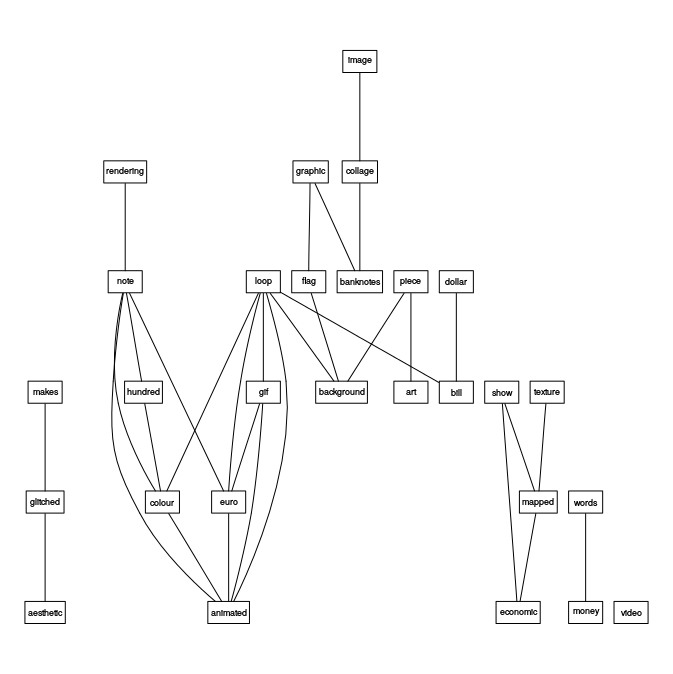 I wanted to try out Topic Modelling on the data but an algorithm for choosing the optimal number of topics simply returned the same number as there are documents. So I tried 8, 12 and 20. [1,] "video"    "mapped"      "price"    "bill"       "animated"
[2,] "bill"     "dollar"      "changing" "dollar"     "architectural"
[3,] "dollar"   "texture"     "image"    "love"       "euro"
[4,] "direct"   "bill"        "show"     "artist"     "glitched"
[5,] "facebook" "virtual"     "allow"    "google"     "graphic"
[6,] "faster"   "polygons"    "also"     "money"      "money"
[7,] "page"     "constituent" "analysis" "monochrome" "zoomed"
[8,] "abstract" "exploding"   "another"  "pixelart"   "1990s"
[1,] "graphic"    "labels"          "dollar"      "dollar"   "texture"
[2,] "abstract"   "landscape"       "glitched"    "euro"     "blank"
[3,] "aesthetic"  "album"           "bill"        "note"     "blue"
[4,] "album"      "animated"        "video"       "animated" "classic"
[5,] "apparently" "appears"         "aesthetic"   "bill"     "economic"
[6,] "banknotes"  "art"             "application" "image"    "essay"
[7,] "european"   "banknotecollage" "colour"      "loop"     "euro"
[8,] "flag"       "banknotes"       "economic"    "american" "show"
The topics are clearer with more words, these are just the first few for each one. I think this is the closest to what I want in terms of discovering what I have written about, although as I say the choice is arbitrary (or at least aesthetic rather than statistical). Changing the parameters and outputting to PDF creates a more detailed and readable graph. It’s fun and inbetween topic modelling and frequency counts for usefulness. I do try to find the positive in artworks but there was one that gave me an immediate and visceral negative reaction in the show (you can spot it if you look hard at the reviews). I’m surprised that there are fewer that count as positive. I “love” one of the pieces. Is it in the positive list? "Martin Kohout" "Marc Stumpel"  "Ciro Múseres"
It’s not. But one of the ones listed does mention “love”, so I don’t know what’s happened there. Sentiment analysis has improved greatly over the last few years, but apparently not in the library I was using. If I was going to use these techniques to help review art I’d write longer “bag of word” descriptions for each artwork, with fragments of text and individual words acting almost as tags or streams of consciousness, and I would then use topic modeling and clustering to help pull out themes. I’d prefer to use an algorithm to choose the number of topics, as I feel this is more intellectually defensible, but I like the results enough to use it without. I’m disappointed by the performance of the sentiment analysis library I used, next time I’ll try a different one. Will there be a next time? Yes, the next time I’m reviewing a group show with more than a few artists. Producing this report has been labour intensive, but I’ve a libary of code now and a better understanding of the issues. And I can automate report construction and revision using Knitr, which would allow me to mix Markdown text and R code without hacing to copy and reformat output.